At the top of the main staircase, turn left and you’ll find yourself at the door to The Dogwood Room. This romantic accommodation sets the stage for an unforgettable vacation or weekend getaway at our bed and breakfast in Central Maryland. The highlight of The Dogwood Room is a king-sized bed with a unique and beautiful antique wood and iron headboard. With advance notice, we can transform the king into two twin beds, if that is your preference. Either way, you will sleep soundly on a very comfortable mattress in this spacious and sunny guest room. 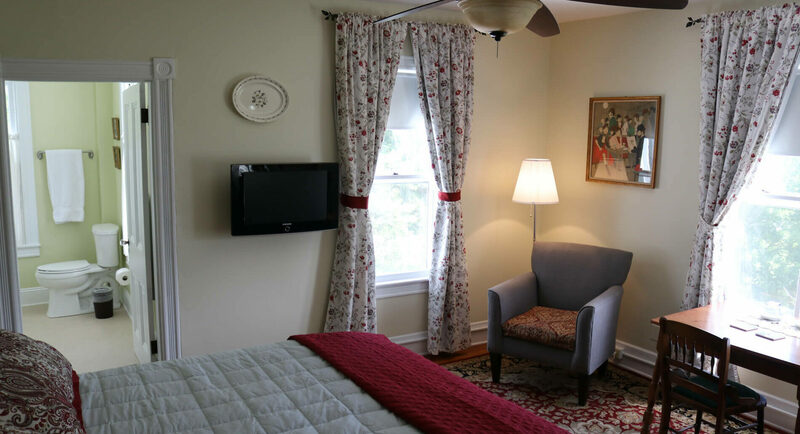 Amenities in The Dogwood Room include: a ceiling fan with remote control, a wall-mounted flat-screen television, a table, a comfortable reading chair, a full-length mirror, a clock radio, and high-speed Wi-Fi (throughout the house). The large and sunny attached bathroom has a bathtub and shower. 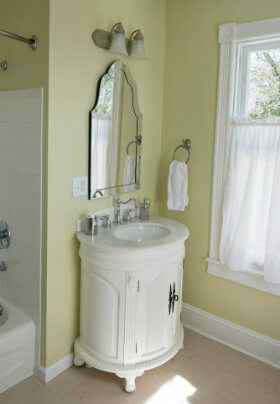 It is furnished with an elegant marble-topped round sink vanity and a hand-painted make-up table with a vanity bench. 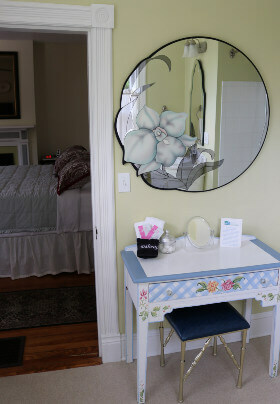 Bathroom amenities include: a magnification mirror, hair dryer, soap, and shampoo.